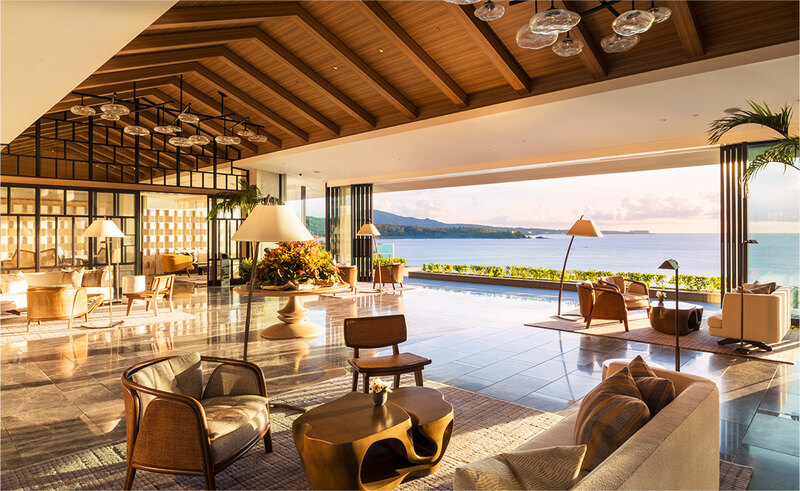 Halekulani Okinawa, the second Halekulani hotel, will make its appearance in Onna Village on the main island of Okinawa, which has some of Japan’s most beautiful beaches. The resort faces approximately 1 mile (1.7 km) of coastline, and features 360 rooms, each with a picturesque ocean view of a shining emerald sea and white sand beach. Situated in the Okinawa Kaigan Quasi-National Park, the abundant natural scenery of the resort can truly be described as a paradise. 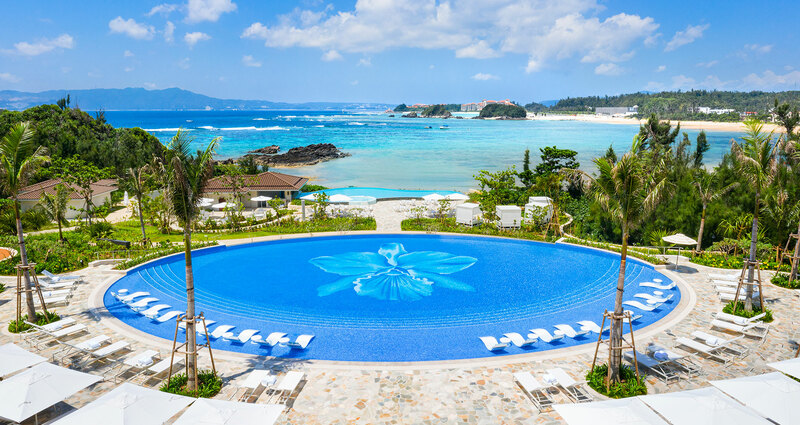 While the facility is a beach resort, it is set among lush Okinawan trees, and the eye is drawn into the glistening sea and greenery amid the sound of waves crashing on the beach. From the moment guests arrive at the resort, they are completely removed from everyday life taken to the sparkling sea and the ocean’s roar as the setting sun sinks slowly beneath the waves on the horizon. 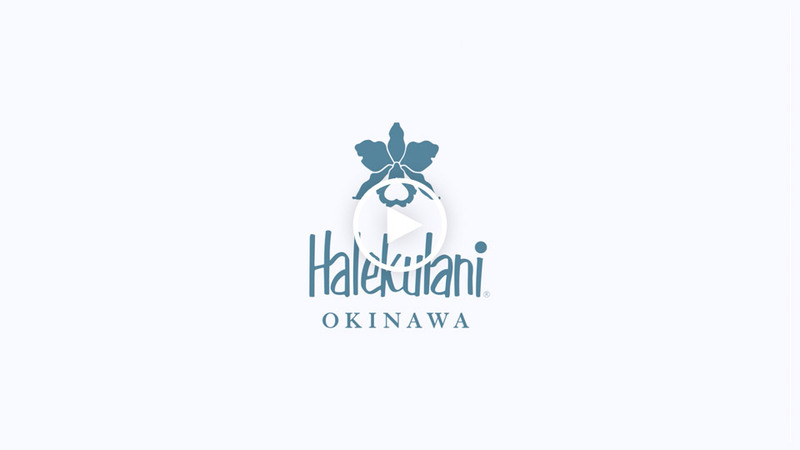 Check out our exclusive behind-the-scene video of Halekulani Okinawa. 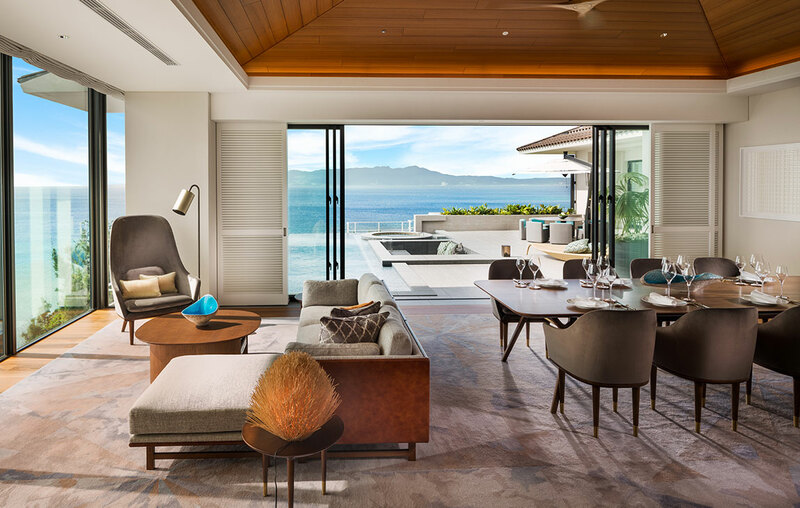 All 360 guest rooms allow for ocean views and five villas are equipped with their own private pools and natural hot springs. All 360 rooms have at least 538 ft2 (50 m2) of space, one of the largest in Okinawa. 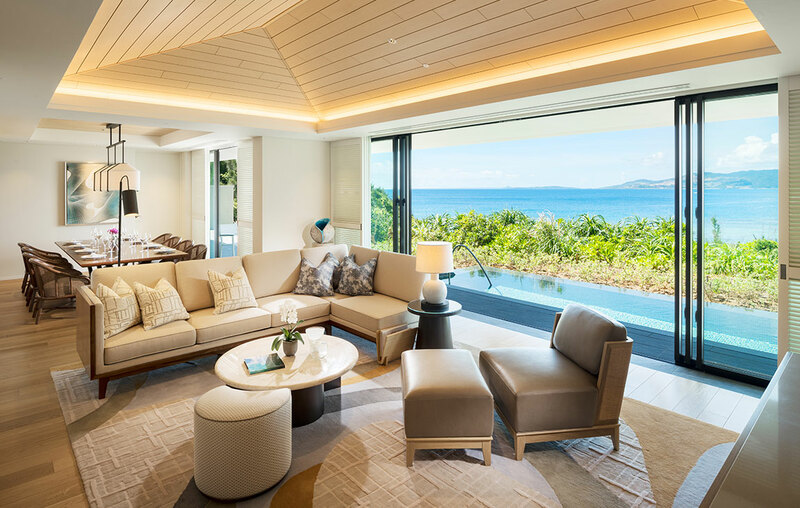 Five stand-alone villas with a stunning ocean views come with their own private pools and natural hot spring baths. highly original dishes that bring out the full flavor of ingredients from all over Japan, among them, many celebrated local Okinawan foods. an entertainment area with 64 seats and a pool bar area with 26 seats. 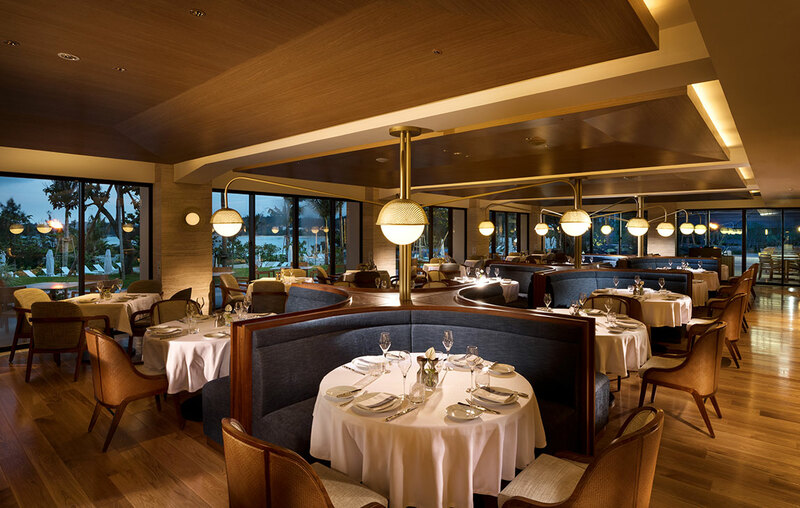 Our two Michelin starred chef, Kawate’s highly original French-based cuisine is designed to bring out the full flavors of mainly locally-sourced ingredients. 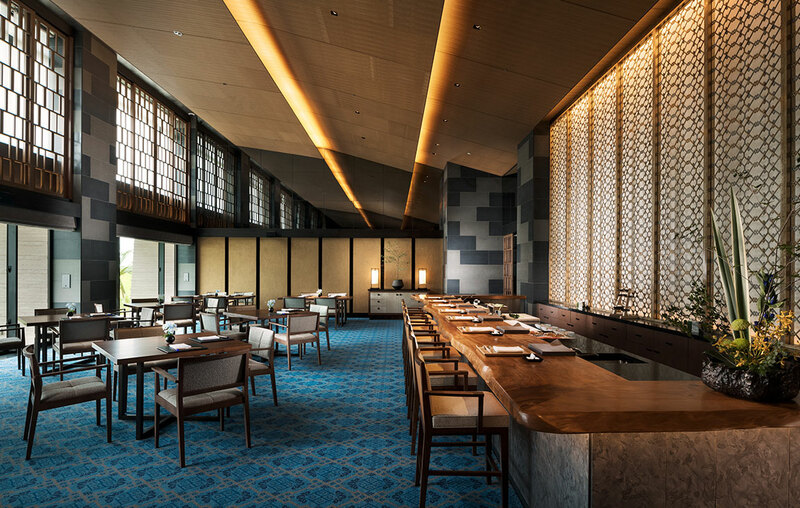 "Aomi" serves traditional Japanese cuisine with a creative twist, casting a spotlight on the freshest of local Okinawan ingredients. The name Kingdom reflects the dynamism of the steak served on the table. Center stage are seasonal ingredients and carefully-selected meats from across Japan and beyond. 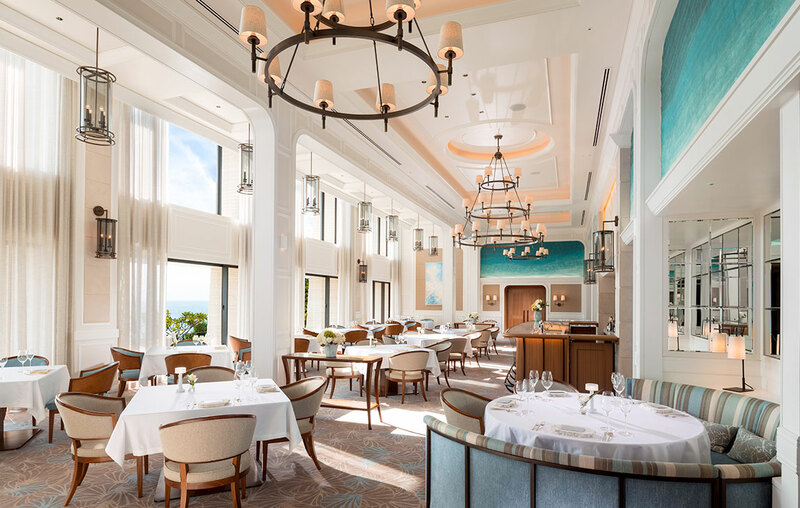 The iconic all-day dining restaurant at the flagship Halekulani Hawaii makes its first appearance in Japan. Spectra- meaning "range of colors"- reflects the dynamic gradation of skies, from sunset to stars. 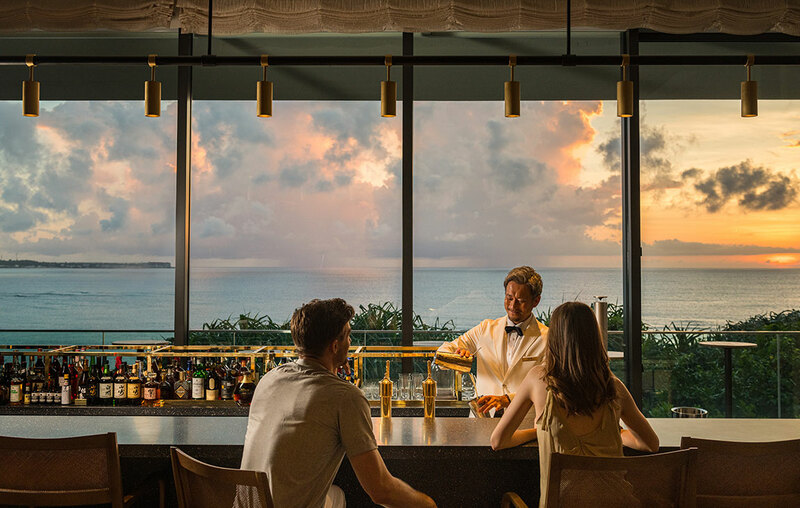 Sit back and enjoy a range of original cocktails while soaking up the spectacularly colorful sunset views over the sea. Chef Kawate will operate as Consulting Chef for the innovative restaurant “SHIROUX”. 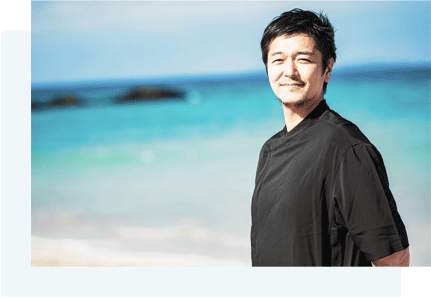 Among Asia’s most acclaimed chefs, he is the owner and chef at Florilège in Tokyo, whose two Michelin stars and No 3 place on the Asia’s 50 Best Restaurants 2018 list attract food lovers from across the globe. SpaHalekulani is one of the most prestigious spa facilities in Japan with a bath fed by a natural hot spring. 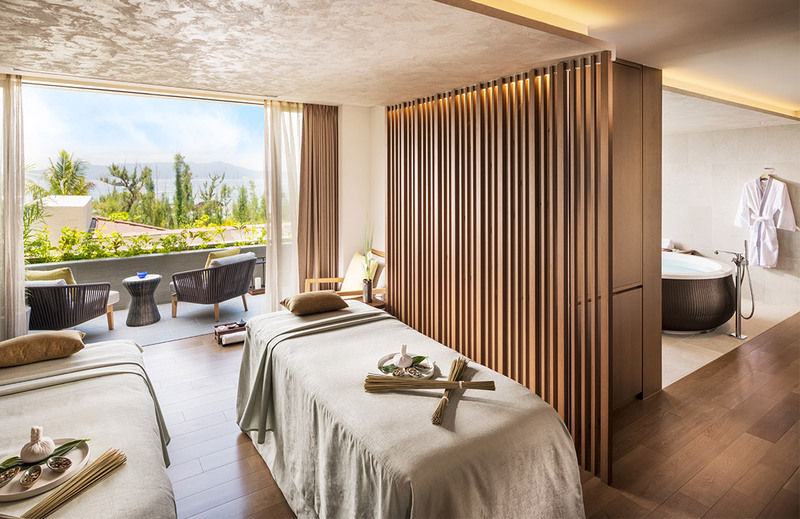 Our high-quality treatments, always tailored to your individual requirements, guarantee an unforgettable experience to complete your spa experience with us. 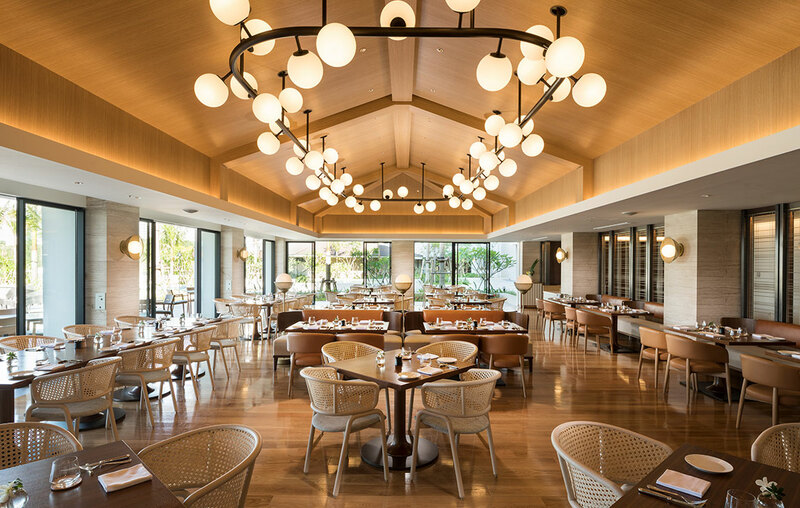 The hotel offers a beachfront of glistening white sand extending along a north-south direction, five different style indoor and outdoor swimming pools, including a pool adorned with around 1.5 million mosaic tiles in the shape of Halekulani’s signature orchid. 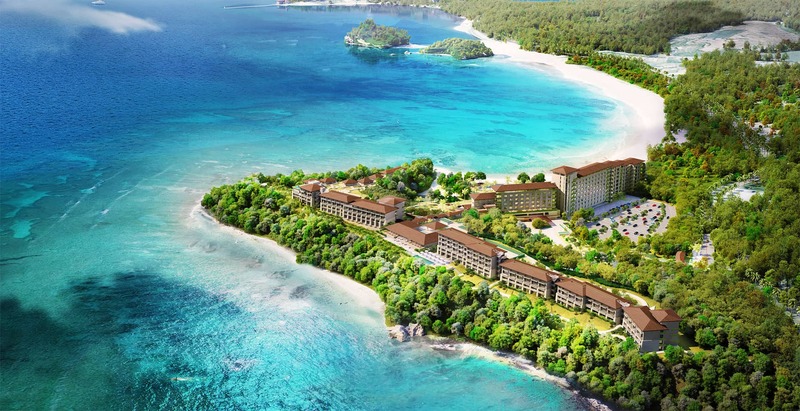 Halekulani Okinawa will inherit the accumulated traditions and spirit of Halekulani, while making full use of the attractions of Okinawa, such as its abundant nature and culture, aiming to create a one-of- a-kind luxury resort. The information, designs, layouts, logo marks, characters and trademarks as exhibited on this Webpage shall be subject to the intellectual property right (e.g., copyright), usage right or other right of this Company or the licensors who have granted this Company with the license to use the same. You are permitted to use this Webpage insofar as your use does not infringe any one of such rights. Any unauthorized copy or use of the same is strictly prohibited. This Company properly endeavors to ensure that the variety of information offered through this Webpage will not give any unexpected damages or disadvantages to the guests, and uses the care to exhibit the up-to-date and accurate information on the Webpage. However, nothing herein shall warrant any integrity, accuracy or usefulness of such information. Therefore, this Company shall have no liability for any damages or disadvantages incurred by you as the result of your action in reliance on such information. This Company shall have no liability for any damages or disadvantages incurred by you as the result of your use of this Webpage (e.g., any accident of software or hardware, pollution with computer virus, loss of or damage to the data), or as the result of any dispute between you and another guest or any third party. If your email or information request addressed to this Company fails to be delivered to this Company due to any failure or accident on the Internet, this Company shall have no liability for such delivery failure. This Company retains the copyright of any emails or other communication that this Company has transmitted to you. Any unauthorized use of such emails or communication on other webpages or printed publications is strictly prohibited. This Webpage may add, change or abolish any information, service content or address with no prior notice to the guests. This Company shall have no liability for any content uploaded by any third party to the bulletin board or otherwise prepared in this Webpage. If this Company should determine that such uploaded content contains any inappropriate content, this Company may delete such content in part or in whole without prior notice. If you desire to attach a link to the top page of this Webpage, please contact the following contact. However, if the linked webpage contains any content contrary to the public order or morality, any adult content or any content defamatory to this Company or if this Company determines otherwise inappropriate, this Company may reject such linking. This Company will comply with the request from the owner of the personal information or the authorized representative therefor for the disclosure, change, deletion or cease of use of the possessed personal data in the following manner. This Company will disclose your personal information in compliance with the Personal Information Protection Act. For the disclosure of the personal information, please make your request through the following procedures. The owner of the personal information and the legal or appointed representative therefor are entitled to make the request for disclosure. Please submit the documentation necessary for the personal identification. For making the disclosure request by an appointed representative, please submit the letter of authorization in a predetermined form. Please pay the fee in the amount of 1,600 JPY (tax included) by enclosing the postal money order with fixed amount. * Such postal money order is purchasable at post offices. Please fill out the Mitsui Fudosan Resort Management Co., Ltd. Personal Information Disclosure Request, and post the completed form to the following reception desk along with the necessary documentation and other required enclosure. Personal Information Desk, Mitsui Fudosan Resort Management Co., Ltd.
* The response shall be sent by post to the address of the owner of the personal information. * Please kindly note that this Company may not possess your personal data. In the following instances, no disclosure shall be made. If this Company has determined that no disclosure shall be made, you will be notified of such effect along with the reasons therefor. Even in the event of non-disclosure, the predetermined fee will not be refunded unless otherwise excepted. If there is a risk that such request may materially obstruct the proper administration of the business of this Company; or If the compliance with such request may result in a violation of any other law. Mitsui Fudosan Resort Management Co., Ltd. will correct, delete and cease the use or third-party provision of your personal information in compliance with the Personal Information Protection Act. For the correction of or any other action for the personal information, please make your request through the following procedures. The owner of the personal information and the legal or appointed representative therefor are entitled to make the request. Please kindly note that the compliance with such request will require the completion of all necessary procedures to confirm the personal identification. Please directly contact the contact desk of the relevant department of Mitsui Fudosan Resort Management Co., Ltd. In acquiring your personal information or posting direct mails or other communication, this Company advises you on the relevant department and the contact information thereof. This company may require your submission of the predetermined form. Please kindly note that it may take some time for the confirmation of your information or the completion of the correction or other requested action. Even if your request is submitted, this Company may be barred from complying with your request for a reason that the law requires otherwise or any other relevant reason, in which case you will be notified of such effect along with the reasons therefor.